DSC_1661_20130908_160220, originally uploaded by Midnight Matinee 24.
quel weekend! in Fort Wayne INdiana! Jen “Sure Shot” Wilson, the first photographer to witness GTAR coming out of the Derby ooze, captured the doubleheader at Forest City using her trusted Spotmatic film camera. When she’s not shooting Derby her works can be found at www.jenr8. This story contains the notes and photos of Jen Wilson, along with contributions from Dr. Johnny Capote. 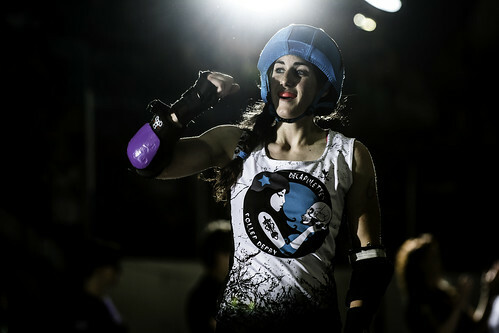 The story of the day would be the heated rematch between the Thames Fatales and Les Filles du Roi, the victors at Beast of the East 2010. During that tournament the Fatales had fallen to FDR by 91 to 12. Whenever Montreal has been on the road this year, it’s always a question as to who would be on the track this time? The match at Tri-City had featured a short-benched Contrabanditas with substitutes from the other MTLRD teams, as had the match between CN Power and the Sexpos. So in the bout at Forest city, who would Les Filles du Roi feature on the roster? While the programme stated the following: “That’s What She Said / Asil-X / Raffy Duck / Krakatoa / Beth Rave / Magnum P.E.I. / Waxey McBush / Al Strapone / Phunky Bladz / Dame of Doom”, all in all there three imports played for Les Filles du Roi that night: Rouge, Nameless Whorror, and Krakatoa. No matter the line-up, Les Filles de Roi always play it tough, and it is never a good idea to cross them. Especially with Nameless Whorror in their line-up for the day. Although Montreal has been going through a small string of losses on the road, says Dr. Johnny Capote on Montreal: “They just have been sending patched-up rosters lately, not by choice. 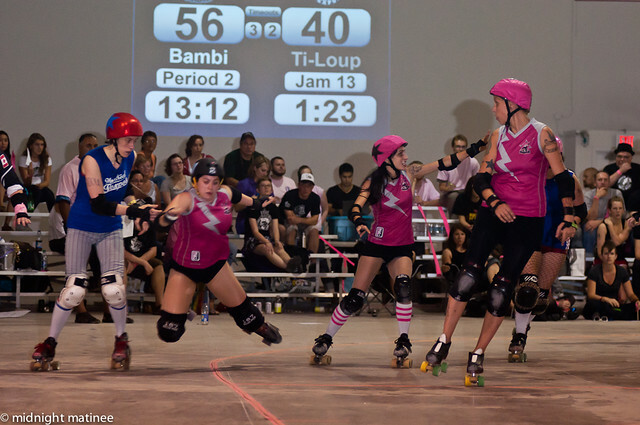 And the house teams have been off since August 6th” after the Montreal Roller Derby league’s Championship game ended with Les Contrabanditas fending off Filles du Roi 99-80 in a Ditas jammer penalty filled second half that nearly doomed their chances of winning. 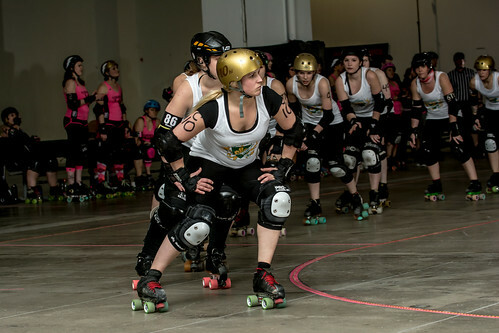 Jen Wilson noted: “The second game was a grudge match between London’s Thames Fatales and Quebec’s Les Filles Du Roi. The crowd needed to be coaxed to roar as the evening took on a slightly more serious vibe. Mirambo keep the energy going as Killson as jammer raced circles around everyone. Slacker Smacker was also jamming a lot but looked like she was taking a beating on her right hip. Les Filles fought hard but was always a bit behind. Magnum P.E.I. was huge and it looked like she would be an impenetrable blocker. However, she was a bit slow and the Thames pack would target her early and hold her at bay. Krakatoa and That’s What She Said did some excellent jamming for Les Filles du Roi, but London was just too strong and they won the game. They were fast and it was a hard brutal physical battle with the emergency crew coming onto the rink at least once, but thankfully no one was seriously injured. 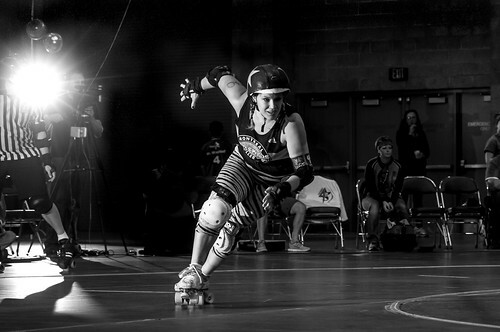 It was a great night for the Forest City Roller Derby and Thames got their measure of revenge. “The night started with an awesome match between the London Luscious Lunch Ladies and the Royal City Rollergirls All-Stars from Guelph. It was an intense game. London had a good lead into half-time with Mighty Thor and Box Kick Betty doing a lot of the jamming against Guelph’s Hot Cross Guns and the Archbitch of Slamterbury. In the second half Guelph came back strong with The Hellcat of Panar jamming quick and slick through a lot of trouble. When trouble found her in the form of the London blockers though, she would fly. London put up a good fight but Guelph quickly caught up to them. They were a mere 3 points behind with seconds left on the clock! 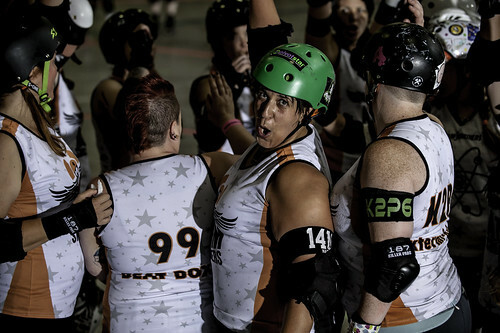 Jen Wilson’s background in Derby: “I took photos of Toronto’s Derby Debutantes when they first started practicing, but I have never been to a real game until this October 1st game here in London. I really didn’t know what to expect. I took a place on the floor in the “suicide seats” area. That was cool. I also placed myself by the corner and figured I wouldn’t move around, just catch whatever action I could from there. I figured that if I moved around too much I would miss something on the other side of the rink, and I didn’t have a zoom. I was also worried about the film so I brought 400 and 200 speed, 200 being the best. I set the aperture (2.4) and speed (125) and then waited for the fun. 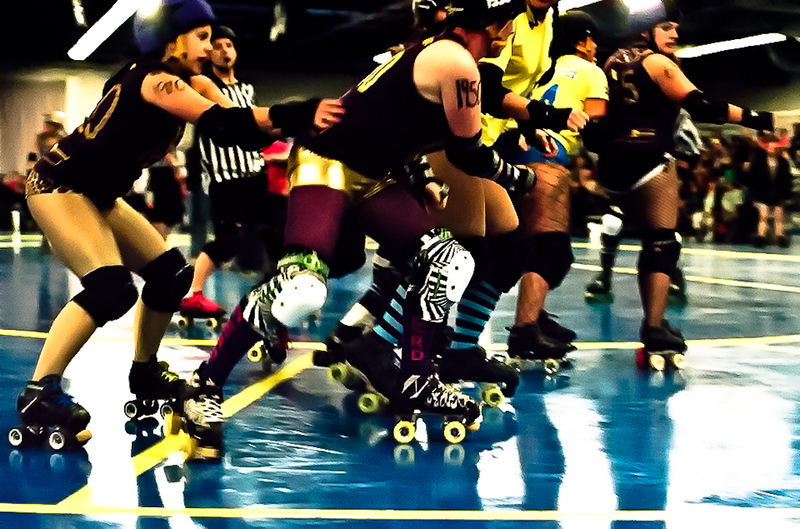 A strange melange of Les Contrabanditas took to the track in New Hamburg on a Saturday night to take on the flying Vicious Dishes of Tri-City. DSC_5205 originally uploaded by Midnight Matinee 24. The Tri-City Rollergirls were just about ready to wrap up their regular home season throwing in their newest and “black and bluest” Total Knock-Outs against the D-VAS from Toronto Roller Derby to start off the evening. Then the second half of the double-header featured Les Contrabanditas from Montreal Roller Derby [MTLRD] against the Vicious Dishes. It was a strange time to be on Les Contrabanditas. Players who did not normally wear the red and black awoke and made the trip to Tri-City. The roster at Tri-City was not what Dr. Johnny Capote saw in Montreal this summer. Our own trips up to Tri-City this year up to the Waterloo Rec Centre always came with some manner of ride to the arena by very generous people within the league or someone officiating [thanks Suzy Slam, Christa Jane, T-Ref], and this time we were met by Lippy Wrongstockings herself and the husband sometimes known as Big Bag who adorned with kilt leads in the charges of the Thunder or Dishes or Venus Fly Tramps with his bagpipes. On the way there was a bit of chat harkening back to the last venture to New Hamburg itself to see CN Power and the Thunder. 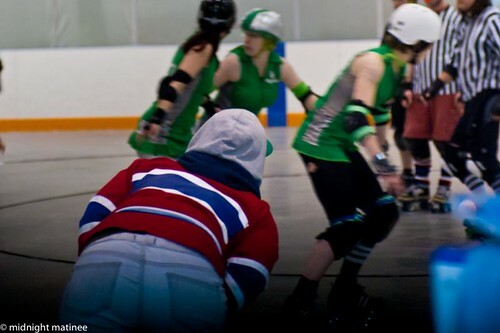 Then the famous encounter of the Thunder against the Montreal Sexpos last August who brought along names such as Georgia W. Tush, Trash ‘n Smash, Nameless Whorror into their lineup. Wonder what became of them since then? So almost as a jest, it was asked who would possibly be in the Contrabanditas roster for the night? And we found out. This was not the Skiditas. Even Sparkle ‘n Maim from La Racaille switched sides for a day. Rookie Ti Loup who had just been jamming with the Sexpos at ToRD against CN Power and down at the Big 5 Eastern championships with the New Skids on the Block as their third jammer … Greta Bobo from La Racaille … Bikini Skills [co-captain of Sexpos, triple threat with Ditas], blocker Dame of Doom, Charlotte Bruise-A-Lot co-captain, Ninja Simone [co-captain, blocker and pivot with Ditas and blocker with Sexpos], Ti-Loup, Roch Dee Taunt blocker … add in Bean Stalker, Naughty Bee Oh!Henry from the Hammer and this was definitely not Ricky Balboa’s usual line-up of Les Contrabanditas. Regardless the Ditas team came to play. 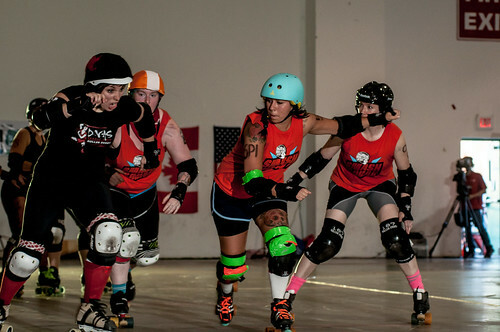 The Vicious Dishes came out with their precision style of speed and blocking and jumped to a very quick lead. Boss Applesauce had her Dishes ready. Motorhead Molly, Skate Pastor, Lippy Wrongstockings, the ceaseless jammer rotation for the Dishes going against the likes of Ti-Loup, Naughty Bee, Greta Bobo. It truly was one of the fastest games seen this summer. And for the first time, Matt S Faction granted photographer access to the centre of the track itself. If the game seemed fast from the outside, trying to track the players from the middle was a thrilling challenge. Not only were Lippy Wrongstockings and Ti Loup and Motorhead Molly and company keeping up a blazing pace, the inner track referees following and calling were another impediment to the view, or they could be embraced and become part of the action itself. The centre is a world of its own with all the bodies on the inside, referees, NSOs, penalty wranglers, line and stats trackers, the referees. 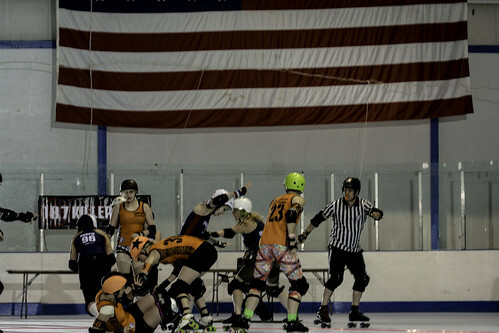 The roar of skates is something the crowd doesn’t hear from the stands, and the four blasts of the whistle calling off the jam is indeed earsplitting. The score stood at 85-10 which looked bleak, but based on the comeback, the Contrabanditas coach Ricky Balboa got everybody in line. The new and current Ditas began to blend and stepped up the pace. “It doesn’t matter what team you give to Balboa, he won’t accept lack of effort from his players, this I know,” says Dr. Johnny Capote. There were maybe a couple of unconventional jammers for the Dishes on the night, with sin-e-star wearing the star once. 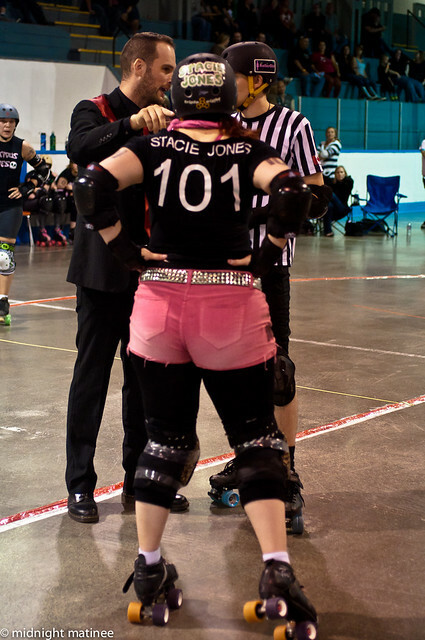 Then Stacie Jones was put in as last jammer for the night with Motorhead Molly as a blocker, but the Contrabanditas were not giving up with Ti Loup running up a final 14-4 jam. The final score of 117-80 was an indication of the Ditas ability to claw back and what could have been. As the track was being dismantled, and the scoreboards wiped clean and display tables carted away, more Derby goodness was on the offering with not just one but two offers of rides back to Toronto, and indeed, two is better than none. Bidding farewell to the players and volunteers who were fueling up on the after-bout repast that Tri City always seems to provide [and being given access to a slice of pizza], they like most leagues everywhere do treat everybody right. Everyone is always willing to field a question or two about Derby, there were multi-discussions with players and coaches about strategies and plays such as the crowded jammer line at the Westerns. So on the ride home, it was comfortable to talk about what people saw on the track, learn more about the draft and the future of the D-VAS in Toronto Roller Derby and tactics once again. All in all there are good people in Derby everywhere, on and off the track, all promoting the world of Derby, and we feel privileged to know them. And we don’t take any of this for granted. Soon to come: more catching up with the stories of being on the road this summer in the pursuit of Derby. DSC_7265, originally uploaded by Midnight Matinee 24. 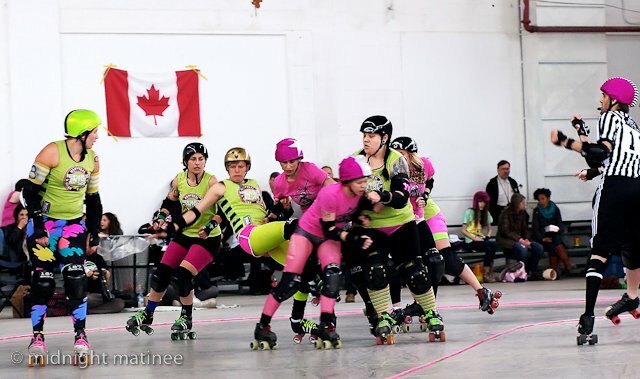 It was another clash of the classes as the rabble rousing La Racaille ventured down the road from Montreal for the first time to bout with the Debutantes of GTAR for supremacy at Social Class Clash. 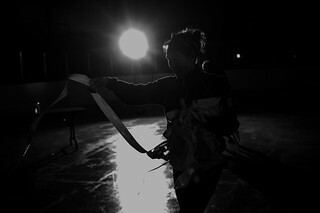 The bout held at the Ted Reeve Arena Bubble on the weekend of the 16th of April was a bone chilling [literally] affair filled with the promise and threat of speed on both sides. It may have been with no small measure of relief for the Debutantes that Bone Machine was back with her old team for the nightCanada’s #3 house team La Racaille—only as bench coach. It could have been quite the roster too if former Racaille Iron Wench, No Holds Barrd, Lyndah Kicks [and Bone Machine] were not now all permanently rostered with New Skids on the Block. But La Racaille still held the likes of Sexpos’ K-Dawg, Sparkle ‘n Maim, Squarrior and their new bloods were not without their own imminent menace on the roster of ten for the night. 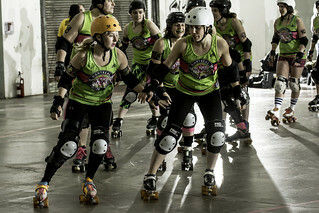 However, for the Derby Debutantes [ranked #21 house team on rollergirl.ca], it had been a long winter scrimmaging and beating the hell out of each other and Chrome Mollys. Memories of their last exhibition match [with a mixed roster of RVRG and GTAR] down in Green Mountain were a season ago. 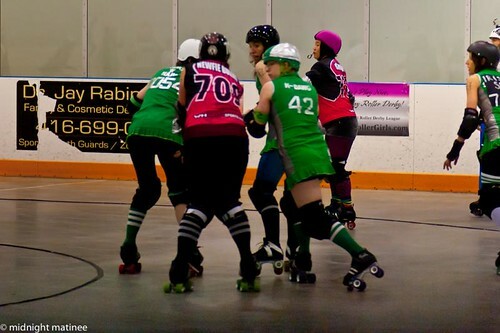 Scrimmages with Royal City, participation in Blood & Thunder and the RVRG Black & White game and other opportunities to skate proved useful and a chance to get Derby legs going. So with the arrival of April, the Debs brought it on, deciding to face Slaughter Daughters and Montreal in back to back pre-season matches. 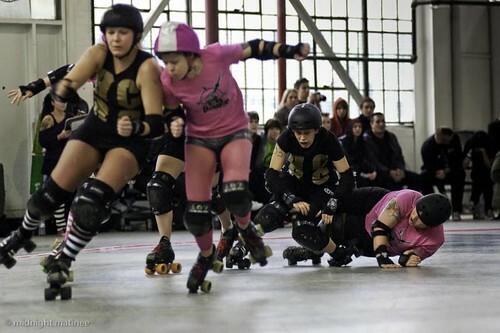 The Derby Debutantes encounter at Parliament Kill featuring the RVRG Slaughter Daughters on the 9th of April was a bruising wake-up call for the team. La Racaille are coming to town! Mark April 16 on your Derby calendar for next month. La Racaille are coming to Toronto.